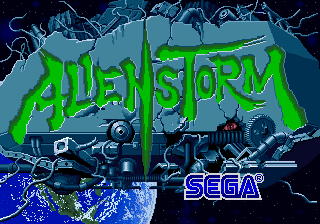 For the Sega Mega Drive game, see Alien Storm (Mega Drive). Alien Storm (エイリアンストーム) is a 1990 beat 'em up game released by Sega for Sega System 18 hardware (supposedly the second game for that platform). When aliens invade earth, it's up to a special forces team known as the "Alien Busters," to get rid of them. Alien Storm is very similar in nature to Sega's earlier title, Golden Axe, though sports a futuristic setting and occasional bonus rounds, and the pace of play is much faster. Alien Storm has three playable characters, however for unknown reasons their appearance and names differ between ports and regional variants of the game. Karla is missing from the Master System version. The overseas Master System versions of the game rename this character "Slammer". Alien Storm was ported to a variety of platforms, including the Amiga, Amstrad CPC, Atari ST, Commodore 64, Sega Master System and ZX Spectrum, most of which being released in 1991. On the Master System, Alien Storm is a one-player only game. The Commodore 64 version was produced by Tiertex, and like other home ports of the game, only allows two players on screen at any given time (and to save on memory, both players control the same character). Introduction sequences were cut to save space, while some sections of the game were altered to reduce the impact of multi-loading (i.e. having to load data from the cassette mid-play). Tiertex used Atari STs to program the C64 game, but relied on Amiga computers for the graphics. For the Commodore 64 version, all sprites were re-drawn by hand, using ripped sprites from the arcade board as guidelines, while the backgrounds were converted through a bespoke Amiga program. Music was composed on a synthesizer, imported to an Atari ST with help from the system's built-in MIDI ports, and then adjusted for use with the Commodore 64. The Amstrad and Spectrum versions, also produced by Tiertex, are largely the same game, however the Spectrum is played in monochrome with higher resolution graphics. Neither feature in-game music. Main article: Alien Storm/Magazine articles. Main article: Alien Storm/Promotional material.